With the spread of 3D printing technology, a revolution is in progress, extending to all sectors of industry. As in every wave of innovation, the number of patent applications is constantly growing. Based on this observation, CENTREDOC offers a new monitoring service enabling you to keep abreast of this field’s technological developments, players and applications. No player wanting to be involved in this type of technology should ignore patent publication activity, whether to protect themselves from any actions from copyright holders, to protect their own assets or quite simply to keep abreast of progress and players in this field. 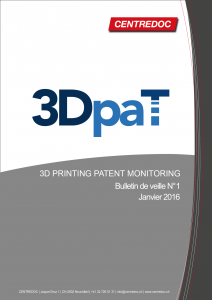 Monthly, worldwide and automatic monitoring of new patent publications. Classification of information by type (machine, process) and applications. The titles and abstracts of the patents are translated into English, whatever the origin of the document. Alerts stored on and disseminated via a secure monitoring platform. Access to additional information (PDF, legal status). No set-up, no configuration, all you need is an internet connection. Invoicing in Euros is possible on request. Access to the archives since January 2015.